13e Tour de France Automobile Rally Plate Style Sticker. 17.5". AC Air Cleaner And Silencer Black & Orange Sticker. 4". AC Air Cleaner Black & Silver Sticker. 2" or 3.25". AC Air Cleaner Circular Sticker. 1.5" or 2.25". 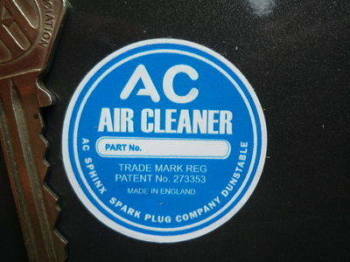 AC Air Cleaner Dark Blue Special Offer Stickers. 2" Pair. AC Air Cleaner Wash In Petrol Every 5,000 Miles. Red & White Sticker. 2". AC Filters Chequered Flag Stickers. 4.5" Pair. AC Hot Tip Spark Plugs Sticker. 2". AC Plug Doctor Sticker. 14.5". AC Plug Doctor Sticker. 22". AC Red Circular Stickers. Set of 4. 1". AC Spark Plugs Orange Circles Sticker. 7.5".